A few simple touches in this meal make it something really special. 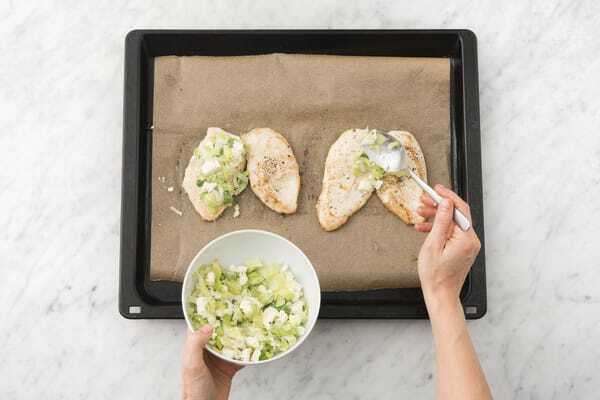 Finishing the butterflied chicken breast with sweet sautéed leek and sharp creamy fetta allows it to absorb all of those lovely flavours and stay nice and moist to boot. Meanwhile rosemary, one of our absolutely favourite herbs to use, gives the potatoes a rich aromatic quality. Preheat the grill to high. Chop the potato (unpeeled) into 3 cm chunks. 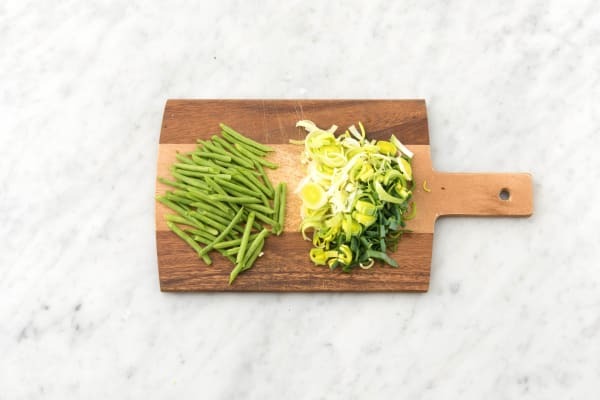 Trim the ends of the green beans and slice in half. Pick and finely chop the rosemary leaves until you have 1 tsp for 2 people/2 tsp for 4 people. Finely slice the leek. Slice the lemon into wedges. 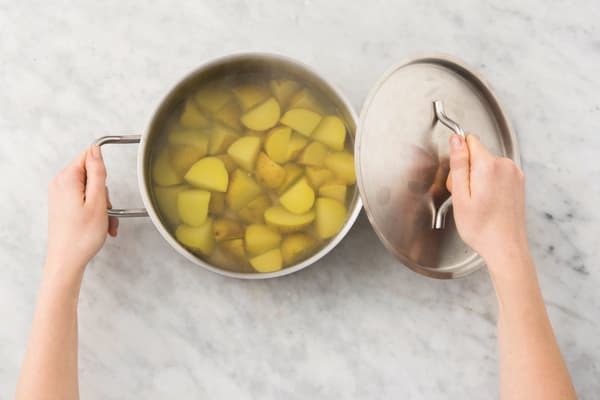 Place the potato in a large saucepan of cold salted water and bring to the boil. Cook for 15 minutes, or until easily pierced with a knife. In the last 2 minutes of potato cooking time, add the green beans. Drain and return the potato and green beans back to the saucepan. Add the butter and the rosemary and toss to coat. Season with a pinch of salt and pepper and set aside. Cover with a lid to keep warm. While the potato is cooking, place your hand flat on top of the free-range chicken breast and cut through horizontally. Rub the chicken with a drizzle of olive oil and a pinch of salt and pepper. Place on the grill tray lined with aluminium foil and cook under the grill for 10 minutes, flipping halfway, until just cooked through. TIP: Butterflying the chicken helps it cooks evenly and speeds up the cooking time! 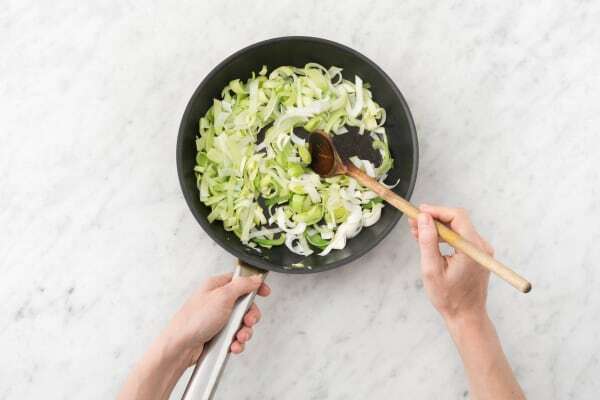 While the chicken is cooking, heat a drizzle of olive oil in a medium frying pan over a medium-high heat. Add the leek and cook for 4-5 minutes, or until soft. Remove from the heat and transfer to a small bowl. Crumble in the fetta and stir to combine. Season to taste with a pinch of pepper. Spoon the leek and fetta mixture over the chicken breast and sprinkle with the dried chilli flakes (if using). TIP: Some like it hot but if you don’t just hold back on the chilli flakes. Return the chicken breast under the grill for 1-2 minutes, or until golden. 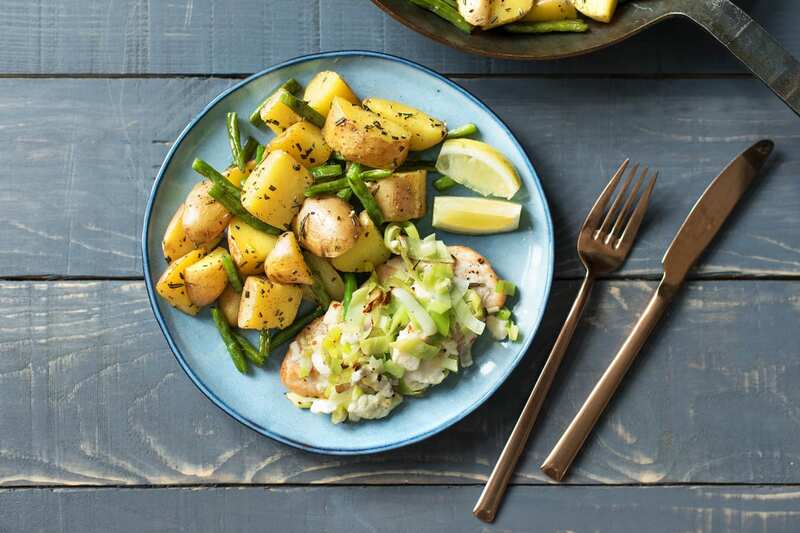 Divide the leek and fetta topped chicken, the rosemary potato and the green beans between plates. 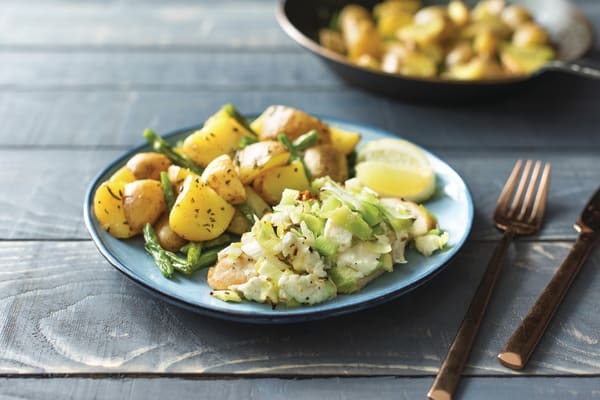 Serve with the lemon wedges on the side.